It is the type of commission that comes along once in a life-time. For Colaton Raleigh artist Alan Cotton it was to produce five paintings of Venice for the Miami home of shipping magnate Howard Frank. 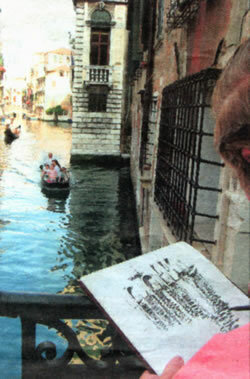 The vice-president of Carnival plc, a cruise company that encompasses Cunard and P&O as well as other shipping lines, and his wife Mary, spotted Alan's Venice paintings on Cunard's Queen Mary 2 and invited him and his wife Pat to their Venice apartment to discuss painting Venice scenes for their dining room. "It was towards the end of 2007 that Alan got the call from Florida asking if we could go to Venice because Howard wanted to commission Venice paintings along the lines of the three Alan did for the QM2," said Pat. 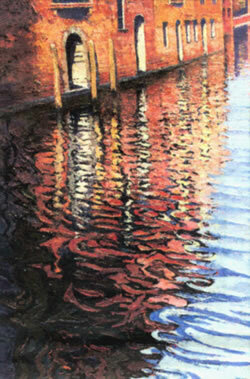 "We were wined and dined then he, Alan and Mary walked the canals, especially the ones near their apartment." Alan took photographs and sketched many scenes for the dining room, which he later gave to the couple. Plans were drawn up of the room and the spaces for each painting, which were measured to fit each wall. "When, in February 2008, Alan said he couldn't do the commission that year because he was working on a major London show they were gobsmacked," said Pat. "But he promised them they could have them by Christmas, even though he still had all the work to do for the London show, which was a great success, a virtual sell- out." Another interruption, albeit welcome, was when Alan was chosen as an Icon for the Duke of Edinburgh Award scheme. Alongside names such as Gareth Edwards, David Jason, Germaine Greer, David Gower, Bruce Forsyth and Sir Patrick Moore, Alan and Pat attended an Icon's dinner at Windsor Castle, hosted by the Earl of Wessex. Nominated by explorer David Hempleman-Adams, Alan, who accompanied Prince Charles to Australia, New Zealand, Fiji and Sri Lanka as his official photographer four years ago, had 10 guests on his table, each having paid £1,000 to join an Icon for the evening. It raised £500,000 for the Duke of Edinburgh Award scheme. 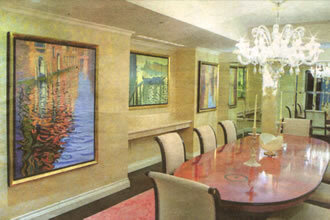 The Franks dining room in Miami with Alan's paintings in situHaving completed the Venice paintings at his studio in Colaton Raleigh, Alan sent them to be framed in Somerset before they were packed and shipped to Miami for December 16, where a team was waiting to hang them. "They got them for Christmas, just as Alan promised, said Pat. "It is the biggest commission he has ever had. "We did a lot of travelling in the New Year to Morocco, Cyprus, the West Coast of Ireland and Snowdonia, and Alan is working towards two new exhibitions, the first of which will be at Sidbury Mill from May 28 to June 6." Meanwhile, Alan is involved in another first - an online show through his dealer Messums - selling original drawings and sketches. "He has never sold them before. He has masses of them and was being pressed to sell them. It is ideal having them online." Back from his trip, Alan is now working on paintings for the Sidbury show and his London show, which opens on September 15. "Art Request of Top Cruise Ship Magnate"